I have often heard of spiritual motherhood but to me it sounded like a consolation prize for those who couldn’t have children. The other day I witnessed it firsthand and learned that I couldn’t have been farther from the truth. 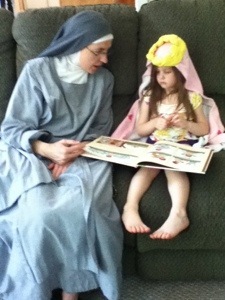 Sister Faustine, one of the Apostolic Sisters of St. John came over to our house for dinner. I was looking forward to it because I wanted my kids to meet a professed religious seeing as we have been talking about vocations as a parish & as a family (that can be a later blog post). God had other lessons He wanted to teach. Throughout dinner Sister Faustine shared stories about the work she does with college students at the Neumann center of a local college, elementary students in a after-school program, gang members from the neighborhood, and inmates from various prisons. It was her stories of the last two that particularly struck me because as she retold the conversations, the former gang members and inmates refer to her as “mom” or “godmommy.” She was the one who had brought the Gospel to them. She was the one who is there for them, instructing them, encouraging them, and cheering them on. Although their biological mothers gave them physical life; it was Sister Faustine who helped Jesus give them new life and make them “new creations.” Therefore the guys are right to call her that. This whole time I’m thinking about how awesome it is that she is leading souls to Christ and heaven. Honestly I was a little jealous that she can do such visible work for Jesus and bring so many to Him. I wanted to be a spiritual mom to so many. 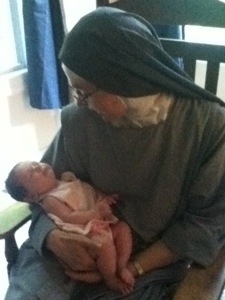 Then The Lord revealed to me that I am also called to be a spiritual mother. First to my children, that is my most important job. It is even more important than teaching my kids to read or tie their shoes. I can also be a spiritual mother to my nieces and nephews. I can be a spiritual mother to my children’s friends. I might not be in the ghetto or in a prison, but I am also called to share the Gospel with as many as possible. I only have 4 biological children. Sister Faustine has many, many more spiritual children. But we want as many people as possible to become Children of God, so let’s pray that ALL women regardless of their state in life become spiritual mothers.